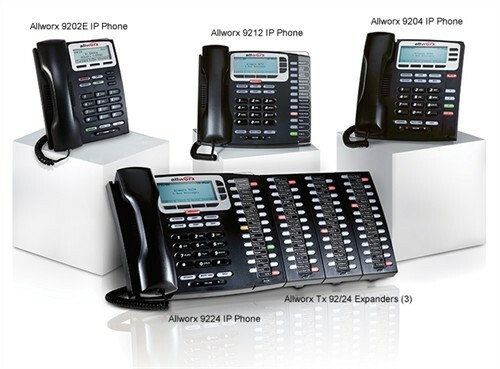 Allworx gives you the largest set of traditional telephone capabilities of any VoIP solution in its class! Many companies claim that they are the best or the easiest, but few can back up these claims. Innovation runs deep. With our history of taking complex designs and turning them into products everyone can use, your total satisfaction is guaranteed. SIP before SIP was cool — ten years ago, our systems were designed to be exclusively SIP based. That decision is what makes Allworx the market leader in IP based phone systems. Intelligence creates power — presence management, caller ID based routing, unlimited call routes, unlimited devices, unified messaging and more create a powerful foundation for your business communications. Mobility in so many ways — from remote phones to Advanced Multi-site serving up to 99 other locations, to ReachTM, a SIP based mobile phone application, Allworx gives you many ways to connect remote locations or employees together. Features as required — powerful features like Automatic Call Distribution*, Advanced Multi-Site†, Call AssistantTM, Conference Center, ReachTM, InteractTM and TAPI are activated easily via software keys … add them as you need them. Allworx is priced right — your total cost of ownership promises to be less than any other fully-featured VoIP communication system. Lowest expansion cost — with no need for gateways,expansion cards or other third-party products, Allworx has the lowest total cost as you grow. Proven savings — with SIP trunks, remote phones or Advanced Multi-Site for multiple offices, expanding your options between sites lowers operating costs. Quick user adoption minimizes training costs for new employees. Hassle free remote access — remote users connect instantly using ordinary broadband connections and without extra hardware, software or cost. Sensibly priced options —software options are priced so they won’t break the bank or incur recurring monthly or annual maintenance charges. Know your long term costs — Allworx pricing is straight-forward and uncomplicated. Optional extended hardware warranties and/or software upgrade keys are available for every budget. Nothing is more important than reliable communications, and Allworx has delivered for over 10 years by maintaining our product line, including ongoing support for the first product we ever built. Same features, same operation — calls continue to work like your traditional phone system, so the switch to an Allworx system is transparent. Disaster recovery — multiple options help to see you through critical situations. Energy savings with less hassle — our products are designed to use fewer parts, and with fewer parts fewer things go wrong, they use less energy and have lower energy costs. New technology can be daunting, so we design our products to balance these capabilities with your need for simplicity. Easiest to use — a choice of Allworx phones with multiple configurations means you can replace what you have today without fear. Intelligent design makes the Allworx system incredibly easy to use and administer. Simple transition — intuitive user interfaces assure that both administrators and users will smoothly learn all the capabilities of the new system without skipping a beat. Easiest to grow — add phones without costly hardware cards or software. Installation is complete in minutes or hours rather than days. Features that match our customers — from schools to real estate to health care, Allworx continues to listen and consistently develops new features that exceed every need. Dedication to quality is not a goal but a way of life. Strict control — from design to manufacture, to inspection, delivery, and support in the field, our strict controls and attention to every detail ensure only the highest quality product is installed. Warranty options — we offer cost-effective warranty options that can be maintained throughout the life of the system. We understand that quality and peace of mind go hand in hand. Contact us today about your needs and we will put an Allworx quote together for you.